Supplementary material reads: "Note to photo room: please make a test on one of these at normal developement[sic]. City desk. Gershon. Illus. Wilmington shooting. 'My husband told me if I ever shot at a burglar, shoot to kill, and that's what I tried to do!' Mrs. Donna Taylor, 25, shows how she leaned out bedroom window to fire at man who entered her home while husband was absent and fled after she fired one shot at him inside the house at 710 McDonald Street, Wilmington. Her second shot felled man. 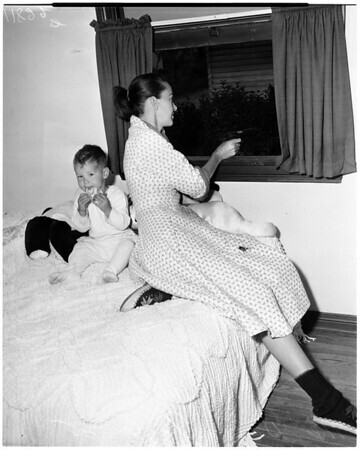 With Mrs. Taylor is son Dana, 2, who slept peacefully in bed on which Mrs. Taylor kneeled to fire".